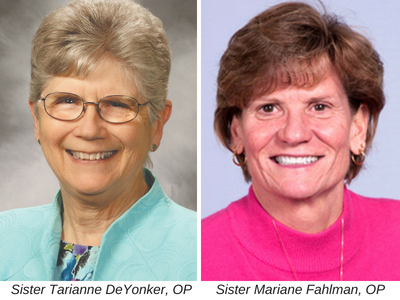 New Vocation Co-Directors for the U.S.
Beginning this week there are two Co-Directors of Vocations for the Congregation: Sisters Tarianne DeYonker, OP, and Mariane Fahlman, OP. Sister Mariane is currently a Professor of Kinesiology, Health and Sports Studies at Wayne State University in Detroit, Michigan where her teaching and research focus on disease prevention through healthy living. She will be reaching out in the metro Detroit area as well as responding to requests from those who are seeking more information on religious life, specifically with the Adrian Dominican Sisters. Sister Tarianne lives and ministers in Adrian, Michigan and is a social worker with a marriage and family therapy background. She has served in numerous leadership roles not only in the Congregation, but also at Dominican High School and Academy in Detroit, a sponsored ministry of the Congregation, in Beginning Experience International, a grief resolution ministry for separated, divorced and widowed men and women and their children and as a team trainer for Returning to Spirit, a program to bring about reconciliation between the church and those who attended Residential Schools in Canada. During the past year, she has been conducting creative writing workshops in Adrian as well as doing writing of her own. 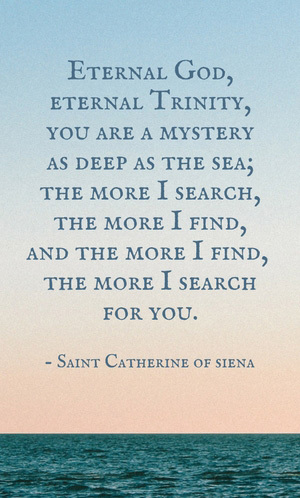 She brings to this new role a listening ear, curiosity about what God is doing in our lives and willingness to try new approaches in response to needs. We are very grateful to Sisters Sara and Lorraine for all the contributions they have made to Vocation ministry and for how diligently they worked to make these past few months a smooth transition for us. We are comforted in knowing they are only a phone call or email away for help when we need it! We wish them well!